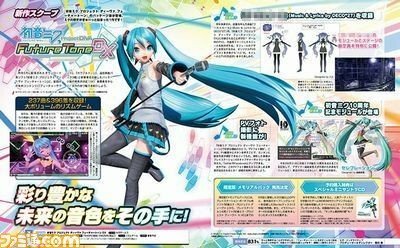 Hatsune Miku: Project Diva Future Tone DX for the PlayStation 4 has been officially announced by SEGA via the latest issue of Weekly Famitsu, according to a report by Gematsu. The new release is scheduled to come out in Japan on November 22 and will include all the paid DLC from Hatsune Miku: Project Diva Future Tone including 127 songs from Future Sound, 95 songs from Colorful Tone, and 12 songs from the three Encore Pack DLC. The game will also introduce new features such as the “Promotional Video Photographing” feature, new songs including “Ghost Rule” by DECO*27, and new modules such as the Hatsune Miku 10th Anniversary Commemoration Module designed by Mari Shimazaki. As previously mentioned, Hatsune Miku: Project Diva Future Tone DX is scheduled for release in Japan on November 22, 2017, for the PlayStation 4. There is no word of a western release as of yet.